So, you’ve read the bit about ‘vector logos’ or ‘vector artwork’ and are now wondering what we’re talking about. Let me explain. Vector artwork is basically comprised of maths, and can be scaled to any size without any reduction of quality. Raster artwork is comprised of pixels and will look correct at it’s 100% (or smaller) size. As you increase the size the quality will degrade as the pixels become apparent. To illustrate this here’s our logo. 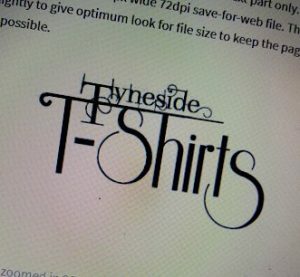 First up a nice clean solid jpeg of the Tyneside T-shirts text part only. It’s made from an eps of the logo. Nice clean lines at 300px wide, 72dpi, save-for-web file. This image has been compressed slightly to give optimum look for file size to keep the page size on the server down as far as possible. Next up is this image zoomed in 200%, note the lines not looking to clever now. Starting to blur, not as sharp and clean. Now if we were running this through our software to create plot lines for vinyl for t-shirts or signs you can see where we would start to be getting problems. Now if we zoom in to 400% we get this. You can now see the pixelation quite clearly. It might look alright if you stand 3 metres back from the screen but still not great. Again, running this through for vinyl would result in square steps instead of nice smooth curves. Now, here’s a screen shot of the eps zoomed in 800%. As you can see still nice and sharp, crisp clean lines (as much as a screen shot of it will let me). Perfect plot lines would result from this, at any size. Another advantage in having vector images is that it makes it easier for editing. Why would I want my artwork editing? I hear you say. Well, if we were digitising your logo for embroidery and some of the detail was not showing properly, if at all, we’d recommend some edits to get the best results. Sometimes we need to thicken lines, elongate sections, all without losing the identity of the logo but necessary to get the best finished piece. So you can see why we want vectors, giving us screen shot or photos of pc screens really isn’t going to get the best results. Here at Tyneside T-shirts we work closely with our customers to ensure their artwork gets the best possible results when printed or embroidered on a garment. 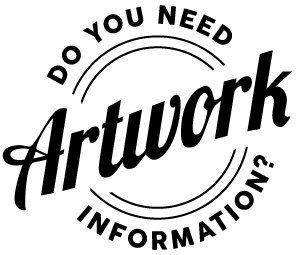 To help here are are a few things to bear in mind when supplying your artwork. In general, you should try and upload the best quality version of your logo or image you have to ensure the best end results, this means vector versions where possible i.e. .ai .eps .cdr. with all of the font’s expanded/outlined so we don’t have any issues with missing fonts. This does not mean take a jpg and run it through an online jpg to eps convertor, it doesn’t work like that. Neither does resaving a png as an .eps, it will still just be a raster image. For more on raster vs vector click here. Also, although if you wish to mock your ideas up in a Word file or such like that’s fine, but any images used in it will not be suitable as they’ll more often than not be saved at 72 dpi at the document size. Also saving to a pdf from programs like Word doesn’t always get the desired file upon output, so again fine for showing us your idea, not so good for print ready files. See also, Power Point, Excel (yes, really) and Paint. We generally ask for files to be 300 dpi or higher at finished print size (150 dpi for large format products), although it does depend on the image and type of print. If you send a file that is too low quality to print or get a good digitized version for embroidery from, we will contact you to discuss how best to proceed. Many online stores just take what you give them and give you back what they get, we don’t work like that, we’d rather take a bit of extra time and get it to match your expectations. We only ask for jpg/png for proofing so we can assess the job before both parties go ahead, that way we are both singing off the same sheet and you don’t find any hidden costs or substandard reproductions. There may be certain limitations depending on the customisation type you select. In particular, certain designs cannot be embroidered, such as those with colour gradients or very intricate designs or using full colour sublimation on Hi-Vis workwear. Rather than try and bodge it we will work with you to find a compromise that keeps your brand (and our reputation) intact. If you can’t supply a vector or high-resolution copy of your artwork then we will of course recreate your work for you. Prices for this are available on viewing of the job, sorry we can’t be more specific here but if you supply an intricate logo with an un-named script font it’s probably going to take a lot longer than a simple Helvetica based logo with a solid motif. Also, what we think we’ve been seeing over the last few years is people getting a logo designed from a site like fiverr or such like, paying the minimum to get the design and then coming to us and having it vectorised. Not entirely sure if there’s actually anything wrong with that from a legal stand point but definitely from a moral one. Pay your designers please. Many of them on these sites are undercutting themselves to get the work, though a lot do just use stock imagery which is illegal and daft (see below), but are relying on you needing the medium or high package which includes the vector version. If you’re going to pay for it anyway, pay the creative. Digitising for embroidery follows the same pattern, if you can supply a vector version then getting the embroidery artwork will be easier. Standard charge here is £10. If we think your design isn’t going to work, say too detailed, too many colours then we will of course offer another version that we are confident you’ll be happy with. This bit is really important so please read it! What we really don’t want here is screen shots, screen shots of things you’ve seen online. Please, just don’t. If you are getting your images of google images, chances are you’re robbing something that is copywritten. Same goes for things with watermarks through them. While we’re on it buying a jpeg from say, Shutterstock, and supplying that to us as your logo is also a big no-no. Even if you pay for the vector versions from stock sites, the design, although licensed to you to use in your work is never available as a logo. The very nature of stock sites means anyone can use them, which means your work isn’t unique, which means it isn’t a logo. Check the license terms, this applies to fonts too. There are many great font sites out there that you can use, but check the license before using in your design. If it says personal use only, then leave it. You’re looking for commercial use. If you supply us a link with your required font and we go to download and it says personal use only, it means we can’t use and charge you for it. Which doesn’t really work for us. If you supply us a logo and we suspect stock images/non-commercial fonts have been used we will check. If it’s the case we’ll tell you and we’ll suggest you take it up with your designer. It’s happened, a lot. We don’t like seeing people get ripped off by cowboy designers, it damages the industry and confidence in all of us when it happens. We should probably add in here that we do offer a full design service, we’re not just here to prep your artwork. Typical positions include left or right chest, full width across the front chest, left or right sleeve, full width across the top of the back and so on. Some garments don’t allow for all positions so please ask if you’re wanting something a little break from the norm. We have 4 types of print for garments, each have their pros and cons. Direct to Garment: The best quality image hands down. Printed directly onto the garment, soft to the touch, it’s the kind of finish you’ll probably have in your head whenever you think of having something done (rightly or wrongly). Dark t-shirts have a white base layer printed below the colour and require a little more care in production and when you get it (seriously, we’ll tell you now, and again when you order but don’t put these in the tumble dryer image side out. Don’t put them in the tumble dryer at all if you can help it, but accidents happen. We’ve tested what happens when you do, so we know). So, image quality and finish are the pros, the cons, well the garment has to be flat so we can’t put, for example, the front of hoodies through, either pocketed or zipped. So the fronts of t-shirts, sweatshirts, back of hoodies etc… If you’re not sure please ask. Printed vinyl: Printed transfers is basically what we’re talking here. Has a stiffer feel to the finished garment (if printing on light coloured garments can be printed on clear which reduces this quite a bit), quality will be as good as the image supplied. Best suited when finish isn’t a major factor, numbers are higher and multiple colours are needed making spot colour vinyl impossible. Think stag/hen etc, a cheaper method than direct to garment, and quicker. Cons will fade over time and harden and crack, especially if washed on high and tumble dried, seriously, don’t tumble dry anything. Spot colour vinyl: Smooth edges, softer finish than printed, this is perfect for text and well worked logos. If your logo has every colour under the sun and gradients then this is out, unless it can be converted into a clean solid. More on that here. This is pretty much the standard method, when you hear that it’ll be from ‘x amount’ this will be the base. If your work can be done like this, it will. It’s hardwearing, great finish, colours last, and it’s the quickest, provided all artwork is present and correct. We have a huge range of colours available so a match to your branding is easy, we even have metallic and glittery versions. Sublimation: Think of this as a transfer, only not like one of those ones from W H Smith that you iron and fall off within a couple of washes. The design is reverse printed onto a transfer paper and then heat pressed on at high temperatures. This method dyes the fabric as opposed to prints onto it so the feel is a soft as the material. As you can imagine this doesn’t work on dark fabrics and printed colours change when printed on anything but white. We use this method mainly on Hi-Vis workwear for clothing as it’s only works on polyester and not cotton, but the system is used for printed mugs, mouse mats, badges and more. Unlike virtually every other print method artwork for this method is done in RGB.